The kitchen icon remains on the menu despite management changes at Channel 4. 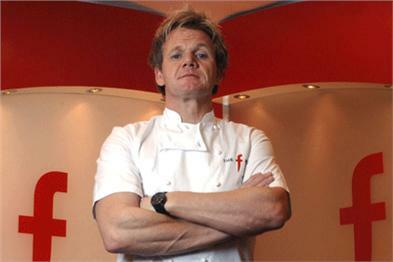 June 2006: Gordon Ramsay, celebrity chef and all-round Caledonian enfant terrible, infamous for saying naughty words, and for TV hits such as Hell's Kitchen, The F Word and Ramsay's Kitchen Nightmares, recommits to Channel 4. He signs a four-year deal worth at least £5 million, ending ITV dreams of stealing him away. "I'm excited about signing this deal. Channel 4 is the standard bearer when it comes to food programmes," he says. July 2008: While hunting puffins in Iceland to add exotic flavour to The F Word, Ramsay falls off a cliff into some rather cold water fully clothed. As he struggles to keep afloat, his panicky periods below the surface reach 45 seconds, until his film crew decide to drag him out. August 2010: While his restaurant businesses and personal relationships prove to be a rollercoaster ride, his TV career goes from strength to strength. The value of the Ramsay media brand is underlined when his part-owned production outfits Optomen and One Potato Two Potato, which produce The F Word, are acquired by the powerful independent production company All3Media for £40 million. January 2011: Ramsay's TV star may be on the wane. Ratings disappoint, and the press has been full of a falling-out with his father-in-law and former business manager, Chris Hutcheson. The speculation is that Channel 4 will not renew his contract later in the year. June 2011: The speculation proves unfounded. Sort of. It emerges that Ramsay is likely to sign a new deal extending his relationship with Channel 4 by another year, but on slightly less lucrative terms. It also emerges that one of the new formats he's likely to be offered will see him banged up in prison. March 2012: Channel 4 plans a series in which Ramsay travels to far-flung locations to devise recipes containing dangerous animals, which he then has to wrestle into submission. But, while in pursuit of the fish course in Nicaragua, he falls into shark-infested waters. With increasingly brief glimpses of his head bobbing above water, his film crew draws lots to decide whose turn it is to rescue him.